You may or may not know that I travelled to Las Vegas to celebrate my 21st birthday. It's a place I'd always wanted to go but I'd never been old enough until this year. Somehow, I managed to round my best girls up and we had the best 5 days taking in the city and sipping a cocktail or 12. Now I know there are a lot of tips and tricks blog posts and videos out there for Las Vegas but I found everyone has different experiences and therefore has different things to say. 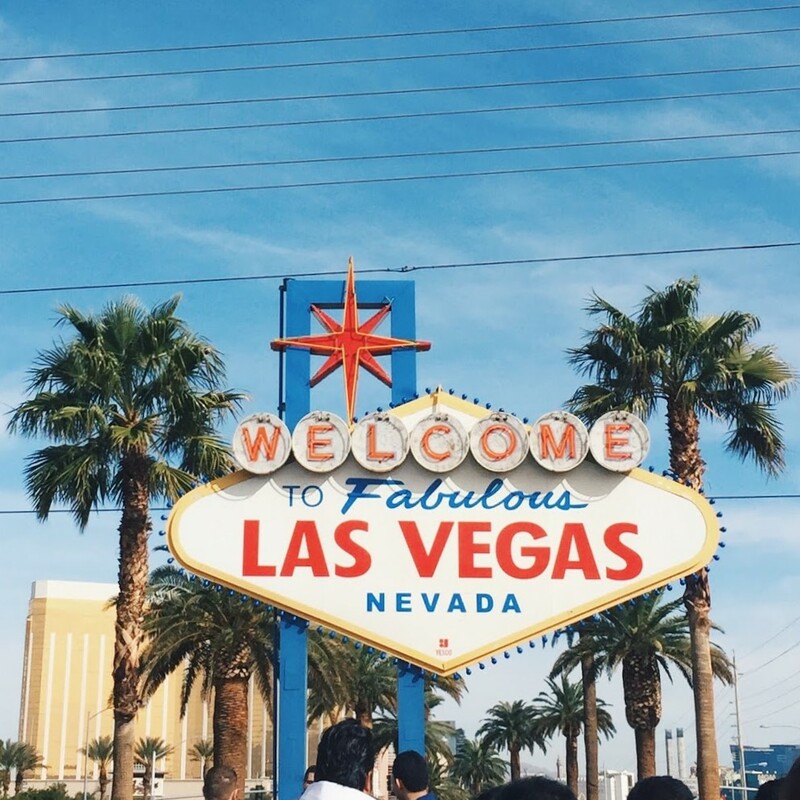 Today, I thought I'd share with you my top 5 tips to consider when travelling to Sin City. One warm, sunny day we thought nothing of stepping off a Gondola ride at The Venetian and walking to the Bellagio to see the fountains - We regretted it almost instantly. Because of the size of the hotels they look very close together, however what was supposed to be a relaxing walk turned into 25 minutes of absolute sweat and very achy feet. My advice would be to PLAN your route before hand. Almost, if not every hotel on the strip has WiFi and an information desk available so before you leave one to go to another, stop and plan a walking route (or Uber ride if you're like me!). Also as the hotels are all air conditioned, it's better to walk through if you can - you can get from Excalibur to Mandalay Bay without going outside if needs be. Sometimes it's worth it just to be out of the sun! By this I mean make sure you've always got sun cream, water and a jacket in your bag because you never know what you're going to get up to. Even though it was overcast when we visited, you can still feel the sun through the clouds and it's so much better to pop some emergency sun cream on than to look like a ripe tomato under the city lights. A jacket is a great idea, firstly because hotels blast the air conditioning like god knows what and secondly because I found as soon as the sun went down, the breeze came with a vengeance. Whilst planning your bag, also plan the best shoes to wear, especially if you're walking all day. Right from your arrival at the airport, Limousine drivers will be trying to hustle you in for a trip that can cost easily $100 and that's just to get to your hotel. Unless that's how you want to start your trip then it's definitely worth telling them you already have a ride sorted even if you don't. That in mind, you can now either go and get a taxi, get the bus, hitch a ride (not recommended) or whatever else you feel like doing. We got the bus, it worked out to about $9 each and arrived super quick and dropped us at the hotel door. With regards to taxis, I've heard stories from friends of taxi drivers charging $40 to take them from the airport to the hotel because they've taken a detour on the sly. ALWAYS tell them you've been to Vegas before and if they ask which route you want to take, tell them 'The freeway' then wing it. You'll save half of the time and money, trust me. I had zero intention of catching a taxi while in Vegas so I gave Uber a whirl. I'd used it in Manchester and Leeds so thought it'd be pretty similar - It worked WONDERS. It does use wifi or mobile data to find your location etc but as most hotels and restaurants have wifi, it's really not an issue. You can see a fare estimate so you pretty much know how much you're paying before you set off and also, all of the drivers details are listed in case you're stuck looking for one black car in front of an extremely busy hotel. An Uber tip would definitely be to take into consideration the pick up locations. The app will list it for you, you just have to make sure you find it. We stayed at the Luxor so the pick up location was the North Tour Lobby. This was fine but we were on the 24th floor on the other side of the hotel. I found it always best to book when we were near the door! That way you avoid a charge for either being late or missing the ride all together. Also, remember to tip your driver at the end of your trip. Sure, you're in Vegas to see the hotels, go to clubs and gamble in the casinos but there's so much more it has to offer. Heading Downtown were two of the best nights we had in Vegas. It's much more casual and the drinks are dirt cheap in happy hour which makes it the perfect place to have a tipple or two. It was also the only place we could find a decent spot to sit outside so that was a bonus. We also took a trip over to the Grand Canyon which was hands down, the best experience of my life. It was a really sunny day and we had the best helicopter pilot and it was crazy that something as amazing as that was right on the doorstep. If you've booked through a tour operator, be sure to make sure your reservation is confirmed by calling them. We made this mistake with our first booking and so we had to pay again as the third party insisted it was our fault even though nowhere stated we had to do that. I know this sounds obvious but I think people can get so caught up in making sure they see every nook and cranny of the city that they forget to actually experience it. Be sure to ride the roller-coaster at New York, New York and take the zip wire down Fremont Street. See a band at Mickie Finnz and spend some spare dollars trying to catch a lobster. Also the cocktails at the Stratosphere's Air Bar will blow your mind and there's an amazing view of the strip and the surrounding valley. I hope you enjoyed my Vegas tips, I'm thinking of going back next year so let me know if there is anything else you recommend! The Grand Canyon helicopter tour sounds incredible! Hi Kat, thanks for visiting! It's definitely somewhere I would do again, there's so much to see and do that I don't think I'd ever get sick of going there.